The lovely and ornate Schermerhorn Symphony Center was the temple of tempo for two hours on Tuesday, July 26, 2016 as legendary Culture Club made a much-anticipated stop in Music City. Boy George and an expanded 13-piece band opened with "Church of the Poison Mind" that had the congregates on their feet and worshipping at the altar of the 80's icons for most of the night. Culture Club rocked the Schermerhorn Symphony Center in Music City. One thing that the venue had in common on this evening with the over 700 churches located in and around Nashville is that this concert was both a redemption story and a triumphant tale of the resurrected career of Boy George and his musical mates. The singer announced from the stage that the band was currently in the midst of the biggest tour in their history that is playing to high praise all around the world. "What an interesting location, we are absolutely surrounded," the sharply attired Boy George remarked referring to the unique layout of the hall with attendees situated on all sides of the sold-out Symphony including an elevated rear stage viewing area and a multi-tiered balcony. "How are you Nashville?" Nashville was just fine with fans cheering loudly revealing their excitement to be in the presence of the English band that rocketed into public consciousness on the strength of their 1982 debut and colorful videos that were in heavy rotation on the then nascent MTV Music Television. The original quartet comprised of Boy George (lead vocals), Roy Hay (guitar and keyboards), Mikey Craig (bass guitar) and Jon Moss (drums and percussion) was intact. Together they were bolstered by a powerful and very effective big-band configuration. The supporting group included a trio of back-up singers, horn section, additional guitar, keys and percussion for a fabulously full sound in a delightful listening room. "So, tonight we're going to sing some of our familiar battle hymns and a few gems you might know," George continued as he pranced the stage and thanked the out of town fans who have been following the band from city to city on their current trek before launching into the upbeat "It's a Miracle". 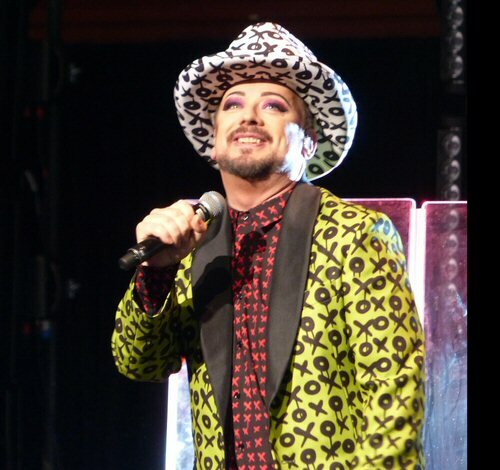 Boy George was all smiles in Nashville. In many ways it was a miracle that this band is thriving and still together to tell their tale. Their famous front-man is well-known to have battled addiction issues and over the years he was a tabloid favorite for his run-ins with the law. But, that's all behind him now and that's perhaps why this performance felt like a festive celebration of life and perseverance. You could easily tell from the positive energy emanating from the stage that George and the boys we're enjoying themselves and not taking anything for granted. "Happy sad song. Which is king of what we do," George shared describing the appeal and the song-writing style of the Culture Club catalogue. "Happy sad songs. Happy on the sadness, melancholy, deep underneath and I think that kind of sums up humanity in many ways and the human condition." The evening's expansive menu of danceable hits garnished with a mesmerizing side of flashing lights turned the venue into a dynamic dance hall for 120 minutes that was an 80's extravaganza both energizing and engaging. The band soon took a delicious reggae detour courtesy of a cover of Bread's "Everything I Own" which shared the melancholy moodiness of their own songs yet remained an inspiring and uplifting high point of the night. They slowed down the pace just a bit for the serious piece called "Black Money" which featured one of the female singers and Boy George accompanied by piano before ramping back up for an extended jam that allowed Boy to run backstage for the second of his three costume changes throughout the concert. "Miss Me Blind" was an enthralling and beguiling moment complete with its notable guitar solo that George promised he wouldn't sing over. This number led directly into the band's first breakthrough hit "Do You Really Want to Hurt Me" including a story about how the record label released the single in a plain white sleeve that George admitted was probably a good idea at the time. 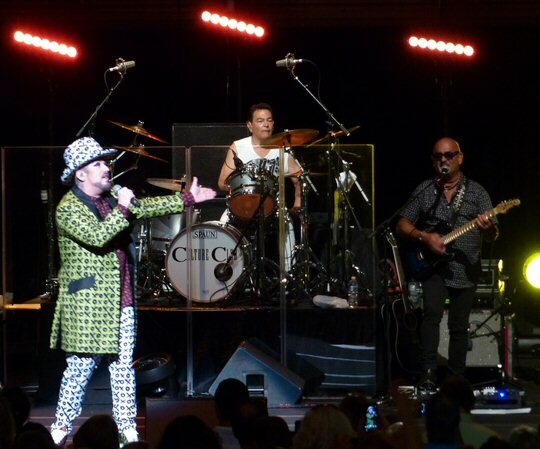 Culture Club carry on in triumphant fashion in Nashville. During the show the personable, charismatic and at times comical George name-checked local heroes Dolly Parton during the intro to "I'll Tumble 4 Ya" and Johnny Cash before playing the well-received "Runaway Train". Boy George detailed how he had been sitting in a cab in Boston as a song by The Man In Black played in the background. George said he realized the he needed to write a train song right then and there and the one he came up with certainly retained the influence of the country legend's signature sound. The obligatory encores included the funky "Karma Chameleon" and the T. Rex classic "Get It On (Bang a Gong)" that served as a charged up vehicle to bang out band introductions before sending the patrons merrily out the door and on their way. This was a memorable night of music not soon to be forgotten by the card carrying members of the Culture Club both new and old. Culture Club are no strangers to breaking new ground and soon they'll have new music on the way yet again. As the first multi-racial group with an openly gay front man, Culture Club has set many records, including being the first band since The Beatles to have three Top Ten hits in America from a debut. In the eighties the outfit dominated the charts in over a dozen countries, with multi-platinum success and more than 50 million albums sold worldwide to date. In 2014, Culture Club reunited to create new music and has been in the studio putting the finishing touches on their latest Tribes, available now for pre-order, set to release later this year. The mission of The Nashville Symphony is to inspire, entertain and educate through excellence in musical performances that go beyond classical as in the case of 80's pop legends Boy George and Culture Club. Upcoming events at the Schermerhorn include Lyle Lovett and His Large Band, Peter Cetera, Nitty Gritty Dirt Band, Anderson Rabin & Wakeman and Michael W. Smith. 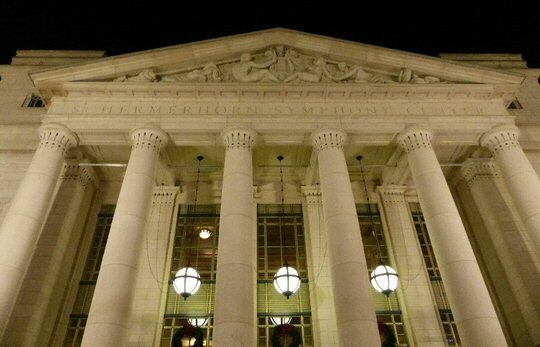 The Schermerhorn Symphony Center is one of Nashville's most beautiful venues.